Serum virtuoso, fresh liquid carefully decorated with fine micro bubbles, with floral notes of lotus and peony on a mesmerizing background musk and amber. The main assets Rocher flower: In the Mexican desert of Chihuahua, the Rock of Fleur never dies. It merely morning dew to survive the extreme desert temperatures. This resurrection plant has an exceptional power to preserve the water collected in the external environment at the heart of its cells using sponges. hyaluronic acid and gelling polymers to hydrate and keep water in the skin. Vegetable glycerin moisturizers and betaine. Microbubbles of fine waterproof oils to form an invisible surface film that preserves the water in the heart of the skin. The formulation Rocher Flower fully preserves its effectiveness, the Master Formulator Galenic has developed a customized structure, called water Tamis3 moleculaire TM. Composed of a specific mesh sieve 3, she quickly the vehicle Rocher flower in heart cells. 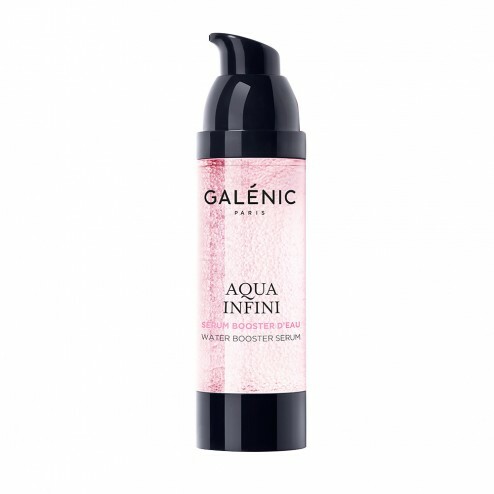 Apply morning and / or evening after your care lotion Aqua Infinity, and before your cream. Formula INCI: Water, Glycerin, isononyl isononanoate, butylene glycol, propanediol, betaine, SD alcohol 39-C (alcohol denat), pentylene glycol, carbomer, amodimethicone, citric acid, disodium EDTA, fragrance, hydrogenated starch hydrolyzate, methyl gluceth-20 , niacinamide, phenoxyethanol, potassium sorbate, selaginella lepidophyla extract, sodium benzoate, sodium hyaluronate, sodium hydroxide.